France is well known for the exceptional wines that are produced throughout the country. Mention wine regions such as Bordeaux, Burgundy, Alsace and the Rhone and experts and novices alike will laud the amazing wines from each of these famous regions. Suggest that Beaujolais is a great wine region and you will be met with odd glances or downright scorn. The simple explanation is that Beaujolais is most famous for its yearly release of Nouveau. It is a wine that celebrates the completion of the most recent harvest with a fun, uncomplicated, quaffable wine that often smells of strawberry and banana. These are not the usual parameters for great wine. The reality is while Nouveau is a commercial success, that success has distracted the wine buying public away from stellar wines that are crafted by the region’s finest estates. The vineyards of Beaujolais are predominately planted in wonderful hillsides locations comprised of largely volcanic and granitic soils. The unique combination of soil and climate has proven to be an ideal environment for the Gamay grape to flourish. The region’s best wines display opulent fruit aromas of blueberry, red current, black raspberry, plum and an array of cherries with spice and floral accents. The wines have an underlying structure based on silky tannins, vibrant acidity and elegant minerality. These traits tend to urge early consumption but will reward patience in the cellar. At their core, the finest wines from Beaujolais provide delightful, hedonistic pleasure. At the table, Beaujolais is a tremendously versatile partner. Classic pairings include beef braised in red wine with mushrooms, garlicky sausages, grilled trout or salmon and fresh goat’s milk cheeses. 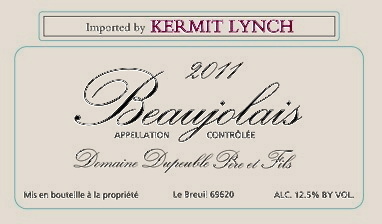 I am fond of enjoying Beaujolais with my Thanksgiving meal. It works nicely with white and dark meat. It has an affinity for hearty, aggressively seasoned stuffing and the wines vibrant acidity cuts through the richest gravy. But the ultimate pairing of Beaujolais for me is a free-range, brined, herb roasted chicken with crispy skin. In the world of great wine, Beaujolais is an absolute bargain. There are exciting wines from the appellations of Beaujolais and Beaujolais Villages that retail from $10 to $15. The ten cru villages, such as Fleurie, Morgon and Cote de Brouilly, provided wines of greater depth, concentration and complexity. These wines are usually priced between $18 and $28. So for the price a solid, enjoyable Napa cabernet you can experiment with 3 bottles of exuberant and enticing wine from Beaujolais. So please visit your local wine merchant and celebrate the 2013 harvest with a bottle of Nouveau. But do yourself a favor and pick out a few bottles of the genuine article and discover France’s most underrated exceptional wine region. This a fantastic intro to Beaujolais is from a family that has been crafting wines for over 500 years. Bright fruit of black raspberry and plum with a floral hint is found on the nose. The wine is energetic and focused on ripe red fruit flavors supported by sappy acidity. Nicole Charion runs this lovely 15-acre estate at the base of Mont Brouilly. This wine offers up an elegant nose of crushed raspberry and red cherry fruit that is accented by a hint of nutmeg. The palate is focused with ripe, almost juicy berry fruit flavors. The silky tannins make this wine almost irresistible to drink. This single vineyard wine is planted on pink granite soils. The wine explodes with mineral, saline notes that frame the candied red cherry and plum fruit. This wine displays excellent structure that would reward a short rest in the cellar. This is one of the region’s benchmark estates. The 2012 is packed with vibrant blackberry, blueberry and red raspberry fruit. The fruit frames a delightful hint of violet, white pepper and crushed stone. The palate is packed with sappy black fruit and lip smacking acidity.